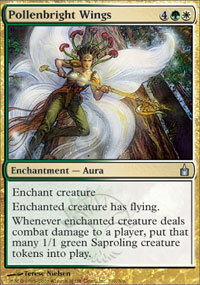 card text: Enchant creature Enchanted creature has flying. Whenever enchanted creature deals combat damage to a player, put that many 1/1 green Saproling creature tokens into play. This card is absolutely the best enchantment to put on scion ..